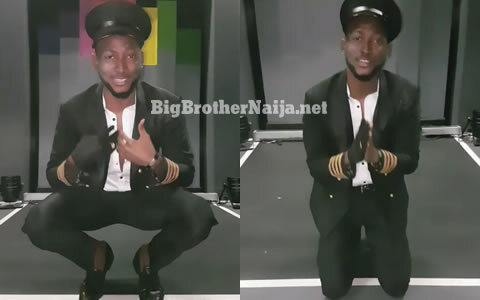 Big Brother Naija 2018 ‘Season 3’ winner Miracle Igbekwe has thanked his fans and everyone that voted for him to win the Grand Prize. Just a few minutes after the grand finale had ended, Miracle was recorded back stage thanking all his fans and everyone other person that voted for him to win season 3 of Big Brother Nigeria. In the recorded video, Miracle is seen squatting in excitement as he says thank you, he later on kneels down on both his knees to further thank everyone that voted for him. Miracle was crowned winner of the third season of Big Brother Naija after receiving 38.18% of the votes that were cast this week, he was followed by fellow finalist Cee-C who put up a strong competition as she received 28.04% of the total votes cast. Following his victory tonight, Miracle is now a millionaire and he’s now going to start a new life that he has always prayed for. Once again congratulations to Miracle. I followed every bit of the show from Freetown Sierra Leone westAfrica. From Season 1 till now… well don Miracle. you were my gai since day one.